I’ve managed to get through an entire 88 posts this year so far writing all about my family, what we’ve been eating- and not eating- and pretty much everything else incidental or important that has happened along the way. Is it surprising that religion hasn’t come up yet? I don’t know. Religion and food have one quintessential thing in common: they are both topics in whose philosophy one can become so ensconced that they dramatically affect everything else in your life. Which is to say, some people treat religion like their food, and some people treat their food like a religion. Perhaps the two were bound to meet- I just didn’t expect that meeting to come in the form of a plastic bag of flyers hanging on my front door. Inside this bag was a bunch of information about a local church, just a few miles down the road from us, and an invitation to their services and Christmas play, as well as a DVD entitled “The Case for Christ.” “Enjoy meaningful worship and music,” it read in part. Well, that sounds good. It went on to detail community service, celebrating recovery… all positive things. Then I got to the coupon for McDonalds. Stapled to it was a card that read “Come visit us on Sunday… Then go for a Sundae!” and quoted the Psalms “Taste and see that the Lord is good.” I kid you not. Is McDonald’s proof that God exists? Apparently, some people think so. I was speechless. The church endorsing fast food? Using junk food desserts as a reward for attending services? When I was a kid we survived the droning sermons and fourteen-off-key-verses of “Oh Thou Who Art Mine Antidisestablishmentartianism” by doodling on the offering envelopes and looking forward to the “fellowship hour” that followed. There, we knew, we could snag more refreshments than we were reasonably allowed while the grown-ups gabbed and drank coffee. That was crap food too, of course: butter cookies from supermarket tins and Kool-aid. So then, was it really so different? I would argue that what was different was that it was still in the church, designed to get members of the congregation to begin talking to one another, become friends, maybe even form a close-knit community that would support one another… all thanks to some free caffeine. Turning the local McDonalds into the honorary vestibule, to me, isn’t quite the same. Instead, it comes off more as a cheap bribe. 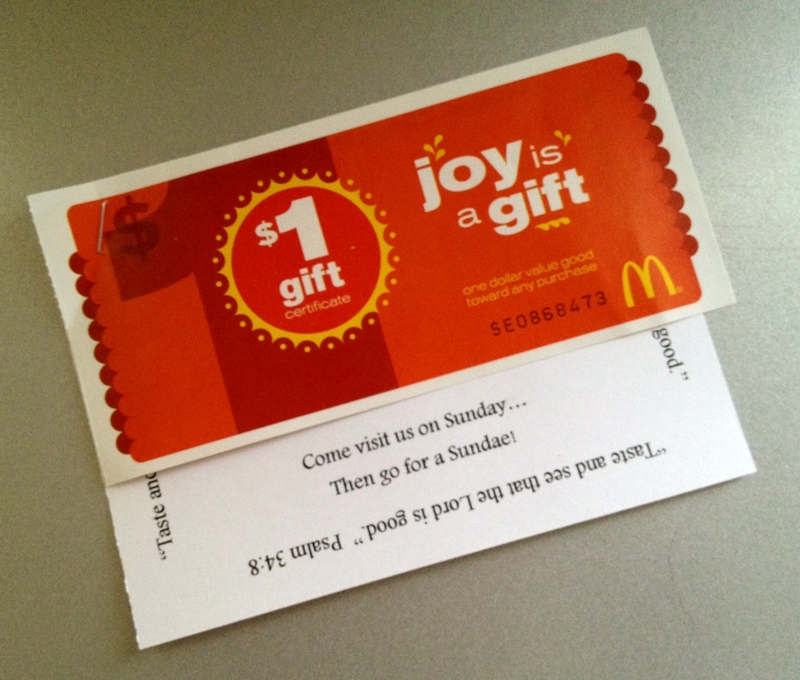 I wonder about the technicalities of this: if you use the coupon without going to church, will you go to Hell? And, if you go collect all your neighbors coupons from their doorknobs before they get home, are you definitely going to Hell? These are all important questions. Back in Jesus’ day food was a simpler matter: some loaves, some fishes… Sugar as we know it had yet to be invented, likewise McDonalds. Honey is mentioned often, usually as an indication of plentitude, as in “milk and honey.” Back then the food symbol of ultimate sin? An apple. Apples have since come a long way: a symbol in today’s society of purity, wholesomeness, and nutrition, Snow White’s experience notwithstanding. It does make me wonder though, if the Bible were written today, would Eve have offered Adam a sip of her McFlurry? Thanks for posting. As someone who has done a yearlong experiment in eating I wish you the best on your worthy endeavor. Thanks Craig- delighted to have my writing featured in your post! You are doing some fascinating work on faith and food- you have a new reader in me. LOLOLOLOL!!! Amen Sista! Preach it! love this post for all the questions that it raises. I’m in public health and often in my work I’m collaborating with community groups that offer health fairs or community festivals and events to bring folks together and help educate them. Almost always these events are laced with incentives like this one or bowls of candies to lure participants over to the tables. The most simple reason of course is that these groups and churches are looking for a way to provide little treats and the easiest way to do that is with cheap candy or donated coupons from crap food establishments. What I wonder is, is it really worth stooping to these lows in pursuit of building a stronger and healthier community? Thanks Mandy- that makes my day! You are currently reading A Year Of No Sugar: Post 89 at Eve O. Schaub.